Software developer, entrepreneur. Currently exploring Blockchain, ML, and CV. It's still the early, wild west, days in the world of cryptocurrencies. There's so much day-to-day drama that it's easy to lose sight of the overall direction in which things are moving. I want to zoom out and take a look at some of the major risks and problems facing the industry and how they might be addressed in the near to medium term future. 1. Transactions are slow and expensive. This is often cited as the biggest hurdle in the way of mainstream adoption. To me, it looks like a solved problem with no shortage of proposals. One such solution is the Lightning Network, currently in alpha/beta, and available on the Bitcoin testnet. Lightning works by transacting on a side-chain and then aggregating/settling payments on the main blockchain (think checking vs. savings account) using smart contracts. It will also enable the ability to send sub-cent micro-payments. Once Lightning becomes available, any cryptocurrency can build on top of it to enable cheap and instantaneous payments. 2. Too volatile to be a currency. The market volatility makes it impractical to store money in crypto unless you are speculating. At the same time, converting back and forth between fiat and cryptos is also difficult; requiring users to deal with banks, wire transfers, verification, etc. This is where Price-Stable Cryptocurrencies may become useful. They work by having every coin backed 1:1 with some real-world asset (USD, gold, securities, etc.) in conjunction with a transparent Proof-of-Reserves. This will allow users to keep money in crypto without risk of volatility and transact as needed without the permission of a bank. 3. Governments will shut it down. Governments interfering is a real risk and they need only mention words like "terrorism", "money laundering", or "illegal activity" to step in. Exchanges are the weakest point of failure right now because they are centralized and run by a single company. I think we will see the introduction of decentralized exchanges that operate as decentralized applications. This will make them incredibly difficult to shut down - just look at P2P file sharing like BitTorrent. Additionally, it makes banning specific coins equally difficult (ex: privacy/anonymous coins like Monero) since they can be exchanged for with any other cryptocurrency. 4. There are too many different coins. Every (legitimate) cryptocurrency has a team, mission, and roadmap behind it. Similar to a startup building a service or app that addresses a specific market of users (ex: Monero or ZCASH for transacting anonymously, Ethereum for apps and contracts, LiteCoin for fast/cheap transactions). Exchange between cryptos will also become instant and easy for users, built right into wallet software, enabled by technologies like Atomic Swaps and ShapeShift. This could enable a model where users store their money in a Price-Stable cryptocurrency (see #2 above) and then convert it when they need to use it. The alternative is that one coin is able to solve every major use case "well enough" that it becomes the dominant player. 5. It's bad for the environment. Proof-of-Work systems like the one used by Bitcoin have been criticized for "wasting" energy. Proof-of-Work's role is to prevent attacks from malicious actors by requiring them to burn energy and therefore making it uneconomical to do so. There is an alternative called Proof-of-stake that accomplishes the same thing, except it asks miners to provide a monetary stake instead of energy. Proof-of-stake is already being used in various cryptocurrencies (DASH, NEO, etc.) with success and has been proposed for Ethereum. 6. It's not user friendly. It's still way too difficult for regular users to store their money securely, or send money without losing your coins if you mess something up. 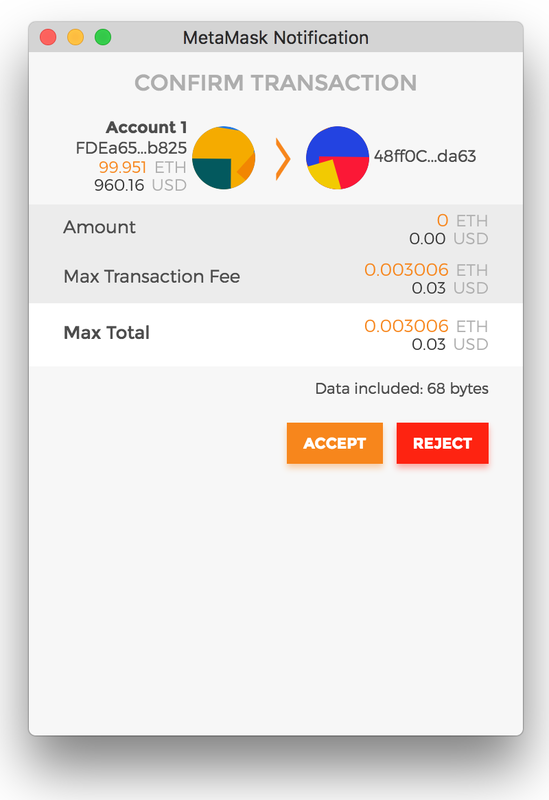 You can see how this integration might work with the MetaMask Chrome extension or Brave browser. Believing that building another feature is what will make your product explode. Time is better spent improving the features that already resonate. Always be getting feedback from users: qualitative and quantitative. It's easy to build features. It's hard to iterate against measurement. One is a lottery, the other discipline. This is Moore's Law over the last hundred years. I want you to notice two things from this curve. Number one, how smooth it is -- through good time and bad time, war time and peace time, recession, depression and boom time. This is the result of faster computers being used to build faster computers. It doesn't slow for any of our grand challenges. And also, even though it's plotted on a log curve on the left, it's curving upwards. The rate at which the technology is getting faster is itself getting faster. A few years ago, my friend Cory and I launched a project, subtly named PriceOfWeed.com, to answer some curiosities we had about the real street value of marijuana. After watching a National Geographic documentary on marijuana where they cited some interesting (but seemingly exorbitant) figures about the price of the plant as it travels across borders - facing different economic/legal statuses from state to state - we realized that nobody really knows the true street price as the flow of information is nearly none due to it's black market status. And so we decided to start an experiment of crowdsourcing this data by simply asking the consumers how much they paid. Initially, the idea seemed so stupid it would be more aptly named a highdea; who the hell would voluntarily submit data about what they paid for an illegal product? The posts picked up a ton of traction, rocketing to the front page of all three websites; people were definitely interested in the mission and it's potential findings. Furthermore, with California's Proposition 19 just around the corner, the timing couldn't be better. As the rate at which people were submitting data began picking up - hundreds, then thousands - so too did the number of bogus price entries. Immediately, we manually removed them by sorting and deleting outliers directly from the database. We'd soon need a more scalable solution. We decided on a simple outlier filter using standard deviations. The idea is that any data points too far (~2 standard deviations) from the average are disregarded from the data set. This cleaned up the data a lot. With outliers no longer affecting the data, the numbers appeared much more accurate. In just a few days we had data in all 50 states and 10 provinces of Canada. The site would also eventually collect enough data for Europe, Australia, and even city-level statistics. The logical next step was to visualize all this data. We plotted the data points on top of a map using Google's API. Green pins for cheap, red for expensive. There is a definitive price jump between the Canadian and US border. For example, the price difference between Southern Ontario and New York - only a few hours drive - is over 200$ per ounce! Does this reveal some sort of arbitrage oppurtunity? Our (somewhat obvious) hypothesis was that the regional prices increased based on the legal and social hostility towards the drug. Although data for the legal status for pot in different regions could be found online, it didn't tell you much about how heavily it was enforced, and certainly nothing about the general public's social attitudes towards it. So again, we found ourselves crowdsourcing this data. We decided to add 2 new metrics - "Social Acceptance" and "Law Enforcement". To avoid cluttering and taking away from the main goal of the site, we added this as a secondary poll on the landing page once the user had submitted a price. We began receiving quite a bit of traffic, driven by coverage from many of the major news outlets including the front page of TIME, Forbes, FOX, ABC, CBS, etc. A beautiful, full-page, infographic also appeared in the September 2011 issue of WIRED magazine. The Washington Post published a detailed infographic portraying pricing changes over time for 8 major US cities. This marked the first time our data was analyzed as a time series. One of the features I wanted to add to my app GIF Grabber in the next version was the ability to set different loop types. In order to support "reverse" and "forward-reverse" style loops, we needed a way to reverse a video (AVAsset) in objective-c. Note: GIFGrabber, despite its name, actually keeps all the recordings in MP4 video format until the user actually wants to save it as a GIF. Manipulating video and adding effects are much easier and more efficient than dealing with GIFs. Resource intensive and slow (overhead of capturing the frame, writing out to disk, reading those images back from disk, compiling, and then writing out to disk again). The quality of the frames will change from the original when converted to an image. Since the reversed video was going to be concatenated with the original, any difference in quality or timing would be very noticable. We needed them to be exactly the same. Since we deal with relatively short videos (30 seconds or less) we wanted to perform the procedure completely in-memory. Use AVAssetReader to read in the video as an array of CMSampleBufferRef (this struct contains the raw pixel data along with timing info for each frame). Extract the image/pixel data for each frame and append it with the timing info of its mirror frame. (This step is neccessary because we can't just append the CMSampleBufferRef structs in reverse order because the timing info is embedded. Use AVAssetWriter to write it back out to a video file. You can find the source code here. In the next section, we'll walk through some of the more complicated parts. First, we initialize the AVAssetReader object that will be used to read in the video as a series of samples (frames). We also configure the pixel format for the frame. You can read more about the different pixel format types here. Next, we store the array of samples. Note that because CMSampleBufferRef is a native C type, we cast it to an objective-c type of id using __bridge. This part is pretty straightforward, the AVAssetWriter object takes in an output path and the file-type of the output file. Next, we create the AVAssetWriterInput object that will feed the frames to the AVAssetWriter. The configuration will depend on your source video - here, we specify the codec, dimensions, and compression properties. We set the expectsMediaDataInRealTime property to NO since we are not processing a live video stream and therefore the writer can take its time without dropping frames. First, we create a AVAssetWriterInputPixelBufferAdaptor object that acts as an adaptor to the writer input. This will allow the input to read in the pixel buffer of each frame. // Append the frames to the output. // Notice we append the frames from the tail end, using the timing of the frames from the front. Note: The structure of each sample (CMSampleBufferRef) contains two key pieces of information. A pixel buffer (CVPixelBufferRef) describing the pixel data for the frame, and a presentation timestamp that describes when it is to be displayed. And finally, we loop through all the frames to get the presentation timestamps and use the pixel buffer from it's mirror (count - i -1) frame. We pass this on to the pixelBufferAdaptor we created earlier which will feed it into the writer. We also make sure that the writerInput has finished processing before passing it the next frame. And finally, we write the output to disk. That's it! Your reversed video should be saved and accessible at the output path you specified when initializing the writer. You can download the final source code here. Here's a useful trick for iOS to dim the brightness further than control center allows. It's a pretty hidden feature and I'm not sure what Apple's intention for this setting was, but either way, it's quite useful for reading at night. Unfortunately, it seems this won't help preserve battery life (it's a software filter and not a physical dimming of the backlight). Go to Settings -> General -> Accessibility -> Zoom. Triple tap the screen with three fingers to bring up the Zoom configuration menu. Set the Zoom Region to "Full Screen Zoom". Set the Filter to "Low Light". Exit the menu and disable Zoom. Scroll all the way down and set your Accessibility Shortcut to "Zoom". Done! Now, when you triple click your home button, it should activate the Low Light filter.